Talk about a manic Monday! If you thought that the financial market ruckus last week was bad enough, you should know that this week was off to a worse start. But if there’s anything I love about being a forex trader, it’s that we can make profits even during times of market turmoil. Heck, all this volatility probably meant more quick pips for some! Not surprisingly, the Japanese yen is among the biggest winners so far, as the lower-yielding currency was able to advance during this risk-off market environment. The meltdown in Chinese equities and in other Asian stock markets has allowed the yen to emerge as possibly the best safe-haven bet in the region, with the brewing geopolitical tension between the Koreas also convincing Asian traders to flee to safety. Next up is the euro, which has been steadily gaining ground ever since Greece managed to secure its third set of bailout funds. While Tsipras’ resignation and the upcoming elections could still stir up a bit of trouble, it seems that euro bulls are feeling giddy now that the debt drama is out of the picture for now and that the shared currency could benefit from improving euro zone fundamentals. The pound and the franc were also able to score gains against most of their forex peers, except for the yen and euro. There’s no denying that the BOE’s Super (Disappointing) Thursday events are still keeping the pound’s gains limited and that the threat of SNB intervention continues to weigh on the franc, but these currencies are on much better footing compared to the ones in the losers’ group. As I’ve mentioned in my article on the 5 Factors Causing Chaos in the Forex Market, the yuan devaluation and the selloff in Chinese equities have delivered a one-two punch on demand for raw materials, dragging commodity prices and their correlated currencies lower. Because of that, the Aussie, Kiwi, and Loonie chalked up hundreds of pips in losses to the currencies in the winners’ group and to the U.S. dollar. Speaking of the dollar, its overall forex performance was still remarkably terrible in the past few days, even though it managed to outpace the commodity currencies and staged a quick rebound following yesterday’s sharp drop. From the looks of it, forex junkies are starting to warm up to the idea of seeing a delay in the Fed liftoff from earlier expectations in September to much later in the year or probably early next year. Apart from the not-so-hawkish July FOMC minutes, dollar traders also seem to be considering the implications of China’s yuan devaluation and the recent stock market selloff on Fed policy. I guess that explains why the Greenback seems to have lost some of its safe-haven appeal lately! 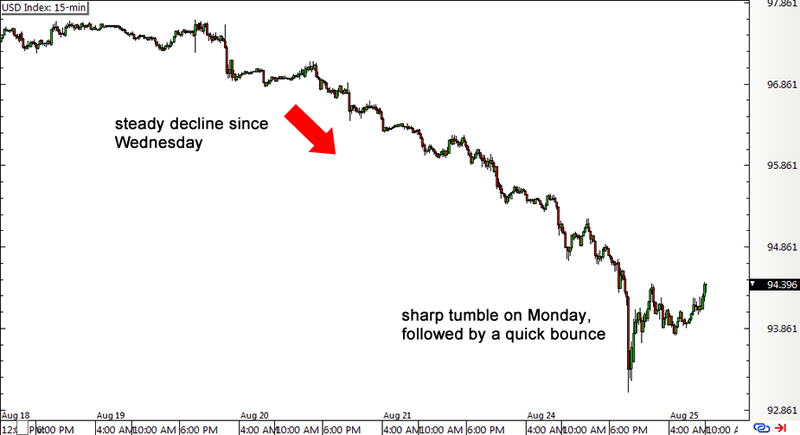 Were you able to profit from these strong forex moves or in other financial markets? Do you think the trends will last or are we about to see reversals soon? Don’t be shy to share your thoughts in our comments section!